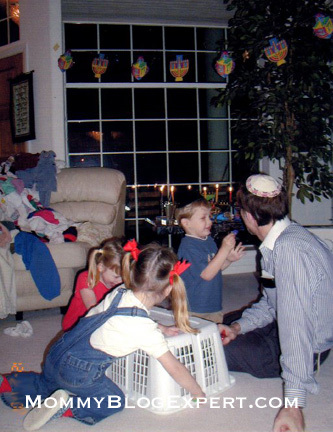 When my 4 kids -- a singleton plus triplets all born within a year -- were in diapers at the same time, I remember how much laundry I had to do every day. I loved dressing my kids in cutesy matching outfits and they always got them dirty since they loved being outside making my job all the more difficult. In fact, newly laundered clothes were constantly piling up on the couch and spilling onto the floor in our living room where I used to fold and sort because I could never keep up with it all. How I hated doing laundry then, especially when I had to fold it and put it away when I was half asleep, LOL. Now those sweet little babies are teens and guess what? Those mere hills of laundry have turned into mountains of clothes, especially my two girls who always seem to have multiple costume changes daily creating a lot more washing and drying for me to do. Besides, how many teens do you know that either pick up their own clothes or help mom with the laundry? Admittedly I still don't enjoy going around the house picking up their clothes or even loading the washer and dryer, then putting everything away. But I do have to say that I like the smell of my freshly washed laundry a whole lot more now after trying the new Snuggle Exhilarations White Lilac and Spring Flowers concentrated fabric softener. Over the years I've used various brand name and bargain brand softeners. Like other products my laundry comes out soft with this, but it is also the first one I've washed clothes with that has the fresh smell of lilacs and other flowers that remind me of spring. Some other brands I've used are too strongly scented and some have no smell at all, but this new Snuggles formulation made by The Sun Products Corporation is a nice compromise between the two. The label indicates that this new product is safe for all HE (high efficiency) washing machines like the one I own. A 32 ounce bottle goes a long way to scent and soften up to 32 loads of laundry since you use only about an ounce of the concentrate per wash. An added plus for me -- since I try to incorporate green living into our family life -- is that the bottle packaging contains 25% or more post-consumer recycled plastic. Something important from the back of the bottle to note: Do not use this product on children's sleepwear or other garments labeled as flame resistant as it may reduce flame resistance. 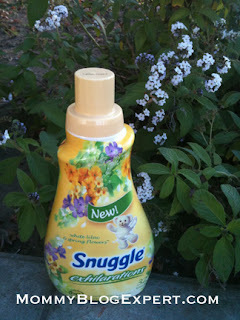 To learn more about Snuggle Exhilarations White Lilac and Spring Flowers visit the Snuggle site. You can also like them on Facebook so you'll be in the loop on future news, coupon availability and promotions about this brand. Have you tried this new Snuggle fabric softener product yet? What do you think about it? If not, tell about the experience you have had with the brand are you using now? You are encouraged to leave a comment and share. FTC Disclosure: I received the product from the brand Snuggle to facilitate this test and review as a blogger and member of the Smiley360 network. 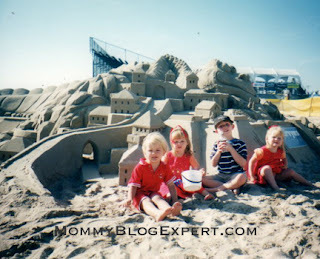 Opinions are my own and MommyBlogExpert did not receive any payment or other compensation associated with this post. See complete FTC Disclosure information that appears at the bottom of MommyBlogExpert's main page and at the bottom of every individual post on this blog, including this one.